This book was provided to me from Xpresso Book Tours in exchange for an honest review. I swear on my bookshelf that this has not affected my opinion of the book. Alive, Kate Dunlap breezed through high school with meaningless friendships and relative ease. But after an accidental overdose ends Kate’s human existence, she’s granted the opportunity of a lifetime. Return to Earth. Save Jake Barton. Prove her worth. Success guarantees Kate an all access backstage pass to heaven. But as she falls in love for the first time, the reformed superficial social butterfly must risk her chance at redemption to guarantee Jake’s life on Earth. I feel as if this book needs a guiding angel of its own. The premise was interesting. There was nothing wrong with the plot. The characters were complex and developed. With a few tweaks and fixes, this could have been a great book, but there were just some avoidable glitches that rubbed me the wrong way. Kate starts off as a belligerent teen who refuses to accept that she intently overdosed on drugs. During the first half of the book, she is shallow, selfish, and slightly annoying. And I loved it. Her character arc and development was the best in the book. She was truly a butterfly who broke out of her cocoon of guilt, regret, and uncertainty to make the best out of a bad situation. I admire her for that, even if she did annoy me a little bit at the beginning. I realize that her behavior was necessary for me to fully love the progress that she made throughout the novel. I also enjoyed Jake's character. He was a cute, awkward, and a bookworm. Most of all, he was real. He had relationship troubles, he fought with his little sister, he got into trouble, and he was tempted. He was just like a lot of other teenage boys. Some of the other characters in the novel felt like fictional characters, but Jake felt like someone I would run into in high school. He was relatable and just gosh darn adorable. Like Kate, his character slowly built up in a beautiful character arc. His secrets were revealed when I did not even know that he had any secrets to begin with. Maggie was well developed for not being the main focus of the novel. She was a great best friend and a truly admirable character. Her character complimented Kate's and balanced out her craziness with a lovely hint of reality. I also really loved Seth in the book. Seth is Kate's guardian angel/sass-master/confidante. He was surprisingly human and a nice twist compared to the stiff, socially inept, and awkward angels in other YA novels and TV shows *cough* Castiel *cough*. His character provided the necessary voice of reason that grounded Kate and ultimately, the novel, in reality. The relationships between the main characters were just as good in the novel. Their personalities meshed together well and created some hilarious, heart-felt, and truly swoon-worthy scenes. The other, secondary characters were not particularly notable. There were a couple of stock characters that you could have seen in any other novel. The main focus was on the four characters mentioned above. This did not do the novel any favors. I believe that some of the secondary characters had more to offer to the plot than they were used for. But that is where the positives end. Despite the potential for the plot to be great and dynamic, it took a turn into Trivial Town. I got all of the details that I really did not need to know, like how they spent their day on the beach practicing cheerleading routines and hanging out with football players (which was also a little bit cliche, just saying) but I felt like I was missing a lot of important information about Kate's angel situation. I feel like the whole angel thing was a little bit glossed over. There were times when I forgot the whole guardian angel aspect of the novel and thought that I stumbled into any other standard YA beach read. Sometimes, I was just confused about what was happening in regards to the angels. Along with the missing information about the angels, I feel like the novel was missing a couple of scenes. I would be reading about Kate talking with her Jake, and then suddenly find myself in an unexpected scene with angels. The transitions between Kate's interactions with the angels and her human friends could have been a lot smoother and less confusing. In the end, the confusion factor, awkward transitions, and cliches, and stock characters as placeholders in the story made a potentially great book not so great. 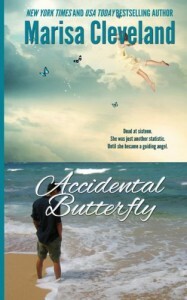 I would recommend Accidental Butterfly to anyone who wants a fresh take on angels in young adult. I would not recommend Accidental Butterfly to anyone who is tired of the angel trope, or is not willing to look past of couple of flaws in the novel.